You're in the mood for a movie. You open up your Netflix account and start searching for something to watch. It can be an overwhelming process. They literally have thousands of choices, though you're a bit of a cinephile, so a lot of the available options are movies you've already watched, and nothing you haven't seen seems to strike your fancy. Many of them you don't really know anything about. It's entirely possible to spend more than the two hours it takes to watch a film just scrolling through all the different options Netflix has to offer. Fear not, intrepid reader, because we're here to help. Below are eighteen really great movies that, for one reason or another, never got the attention that they deserve. They are "hidden treasures," and each of them can be viewed immediately with the push of a button. Great care has been taken to make sure there's something for everyone in the following list. There are comedies, horror flicks, dramas, a few documentaries, and even an animated feature. All of them are movies that probably aren't on your radar, but should be. We think you'll be glad you gave them a chance. Here are 18 Underrated Movies Currently Streaming On Netflix That You've Never Seen. In the comedy/drama The Fundamentals of Caring, Paul Rudd plays Ben, a struggling writer dealing with personal grief issues. He takes a job as the professional caregiver to an 18-year-old guy, Trevor (Craig Roberts), afflicted with muscular dystrophy. The two make an ill-advised road trip to see some of America's most unusual roadside attractions. Along the way, they pick up a young female runaway, played by Selena Gomez. The trip teaches all three of them some important life lessons. That may sound corny, but the movie has a sardonic streak that prevents it from becoming maudlin. Trevor, for example, is a bitter guy who likes to "joke" with people by making them uncomfortable in regard to his ailment. Ben, meanwhile, is sharp-witted enough to give Trevor's treatment right back to him. Consequently, The Fundamentals of Caring is an often hilarious movie about subjects that aren't inherently humorous. By taking a non-traditional approach, the story earns its heartfelt conclusion. Rudd, Roberts, and Gomez are all aces in their roles, while writer/director Rob Burnett shows a knack for mixing comedy and drama in ways that feel authentic. This one stays with you for a while after you see it. Sun Choke isn't technically a horror movie, although it will give you plenty of chills. Janie (played by Sarah Hagan from Freaks and Geeks) has recently had a psychotic break. Rather than getting professional help, she's been left in the care of her former nanny, played by horror icon Barbara Crampton. One day, Janie becomes obsessed with a woman she sees out in public. This triggers her issues, leading to some horrifying repercussions. One of the things Sun Choke does so well is to look at how mental illness is misunderstood. Janie's nanny thinks that she can "fix" her, despite having no training. There's a lot of truth in that idea. How frequently are people with mental health diagnoses told to "get over it" or "just move on"? The story admittedly takes the implications of that idea to extreme ends, but that's okay, because Hagan and Crampton are both superb here. They enact their characters' battle for control in a manner that is nothing short of riveting. Director Ben Cresciman uses a variety of visual and editing techniques to simulate Janie's fractured state of mind, ensuring that the viewer understands how distorted her vision of the world is. The result is a seriously freaky movie. Everybody knows about the monstrous actions of Jerry Sandusky, the former Penn State assistant football coach who used the influence of his position to sexually molest a number of children. It was an event that rocked the university, leading to unprecedented sanctions from the NCAA. Beloved head coach Joe Paterno saw his otherwise sterling reputation tarnished as a result. But what happened to the Penn State community after this scandal? Amir Bar-Lev's spellbinding documentary Happy Valley investigates. Through interviews with fans, faculty, townspeople, and more, the film looks at how being at the center of such a sordid event impacted PSU. Bar-Lev is even-handed, suggesting that many in the community have tried to pick up the pieces following the tragedy. More importantly, he also argues that the concept of a "culture of football" should be taken seriously. Sandusky was able to do what he did because he knew there was a vested interest in protecting the image of the school and its coach. People were all too willing to excuse away his suspicious behavior. Preventing something similar from taking place in the future requires swallowing the hard truths about why it happened in the first place. That will be uncomfortable for many Penn State fans to hear. Nonetheless, Happy Valley isn't afraid to be provocative, which makes it a vital look at how institutions often -- intentionally or otherwise -- put self-protection over the protection of the innocent. The animated feature Snowtime! takes place in a small village where the children are on winter break. They promptly split up into teams for a snowball fight. One of the squads builds a massive snow fort for the activity, which the other attempts to take over. The fight lasts for almost a week, during which time the kids on both sides start taking more and more extreme measures to win. That choice ends up coming with a cost. Snowtime! is designed to be an allegory for war. It's a way to teach children concepts like escalating conflict and the dangers of "just following orders" in a manner that is age-appropriate. The movie makes a strong statement about the futility of war and the win-at-any-cost mentality that makes conflicts grow well past the point of common sense. Such seriousness is balanced out with some delightfully goofy humor, including a perpetually-flatulent dog. It may not be from Disney, Pixar, Blue Sky, or Dreamworks, but this is still a quality animated feature with something of value to say. Based on the popular novel by Dan Wells, I Am Not a Serial Killer tells the story of John Wayne Cleaver (Max Records), a teen boy living in a tiny Midwestern town where there's nothing to do. The monotony is broken when a serial killer starts brutally offing some of the citizens. John, morbidly obsessed with death and seeing a psychiatrist for severe mental health issues, decides to investigate. Keys to the mystery may lie with his kindly neighbor Mr. Crowley, played by Christopher Lloyd. In adapting Wells' novel to the screen, director Billy O'Brien establishes a gloomy, atmospheric tone. This is a seriously creepy movie that gets under your skin. The story goes to unexpected places as John discovers the true horror of what's happening, leading to a grand finale that we guarantee will catch you off guard. Max Records is terrific in the lead role, but the real standout is Christopher Lloyd, who gives one of the best performances of his career as the elderly neighbor with a secret. In the end, I Am Not a Serial Killer is a riveting tale about a kid who compulsively stares into the darkest abyss of human nature and tries not to fall into it. Sleep paralysis is an extremely unpleasant condition in which afflicted people don't fall into traditional sleep, instead going into an altered state where they experience graphic, frightening hallucinations. Often, they are unable to move during these times, meaning that they're trapped, waiting for the ordeal to be over. The Nightmare, a documentary by Rodney Ascher (Room 236), introduces viewers to several people who are afflicted with this disorder. They describe some really unpleasant-sounding visions. Several of them report seeing eerie shadow figures menacingly approaching them as they lay catatonic. One guy sees alien creatures who have TV static for skin. Yet another witnesses demons with glowing red eyes. What makes The Nightmare special is that Ascher dramatizes their stories, thereby putting the audience through an approximation of the experience. This has the effect of making the symptoms of sleep paralysis more understandable than if we were just told about them. It also ensures the documentary will make you grateful that you don't have this condition for real. The Impossible is based on the true story of a tourist family who got separated during the tragic 2004 Indian Ocean tsunami and were miraculously reunited. Naomi Watts and Ewan McGregor star as the parents, while Tom Holland (a.k.a. the new Spider-Man) plays one of their three sons. When the tsunami unexpectedly hits their resort, all of them are washed away and injured. Watts fares the worst, getting badly battered by debris as the currents pull her under. Holland tries to keep her alive while they search for the rest of the family. Director J.A. Bayona (A Monster Calls) stages the tsunami with gut-wrenching authenticity, giving you a small idea of what it must have been like to be helplessly caught up in it. Unlike other movies where natural disasters are played for excitement value, this one is intended to shake you up. And it does! (It certainly doesn't hurt that the special effects are first-rate.) Naomi Watts does powerful work as the woman focusing on her family in order to survive, and she earned a well-deserved Oscar nomination for her troubles. There's no doubt that The Impossible is tough to watch at times, so harrowing are the events depicted, but it ends with a life-affirming message about how, on some occasions, the impossible isn't always entirely out of reach. Richard Linklater has always been one of the most innovative filmmakers around. He likes to try unconventional storytelling approaches. His film Boyhood, for instance, was filmed over the course of nearly twelve years so the young actor at its center could convincingly age, while his Before... trilogy (Before Sunrise, Before Sunset, and Before Midnight) followed the same two characters at nine-year intervals. Another Linklater innovation is Waking Life, shot on digital video with computer animation laid over top of the footage. The process, called rotoscoping, turns real actors into cartoons. Aside from its stunning visual ingenuity, the film -- which follows a young student (Wiley Wiggins) through a dream state where he encounters various diverse people offering up their own unique philosophies of life -- is intelligent and thought-provoking. Waking Life takes an existential look at human existence in a manner that's entertaining rather than stuffy. The amazing visuals give it a suitably surreal vibe that adds to the deep ideas presented. This is a true one-of-a-kind cinematic experience. You may think that found footage movies are played out. To a degree, you're right. Nonetheless, that doesn't mean a good one can't come along every once in a while. Case in point: Creep. Patrick Brice (who also directed) plays Aaron, a videographer who answers a Craigslist ad. The man who hires him, Josef (Mark Duplass), claims to be dying of a brain tumor. He wants to record videos of himself so that his unborn son will be able to get to know him a little bit. But the things Josef wants to be filmed doing, and the way he wants to be filmed doing them, suggest that something else entirely is going on. Creep, which boasts a 96% approval rating on Rotten Tomatoes, couples strong performances from Brice and Duplass with an ingenuous plot that keeps you guessing as to what's really happening. It's a slow-burn kind of chiller, one that takes the time to set everything up so that the eventual payoff is maximized. A dark sense of humor helps to sweeten the deal. If you're in the mood for a lean, efficient horror flick with a potent sense of freakiness, Creep is just the ticket. John Woo is indisputably one of the greatest action directors in the world. His American films have been a little hit (Face/Off) or miss (Windtalkers), but there's no doubt that his earlier Hong Kong movies are all-around great. A Better Tomorrow and Hard Boiled are groundbreaking classics that influenced the way many American filmmakers shoot action scenes. And if you've never seen The Killer, or haven't seen it in a while, don't pass up the chance to catch it on Netflix. Any serious action fan needs to beam this movie into their eyeballs. Chow Yun-Fat stars as Ah Jong, a professional assassin who accidentally impairs the vision of a singer during a fierce gun battle. After discovering that she will be permanently blind unless she gets an expensive surgery, he decides to perform one last hit in order to pay for the operation. The Killer is a story of redemption that is filled with religious imagery. (Woo often inserts Christian ideals into his work.) Whereas many action films are all about the mayhem, the director makes sure that this film uses exquisitely-designed shootouts to get at deeper human themes. For that reason, this is a picture that provides excitement and drama in equal measure. You may remember Miles Scott, the five-year-old that survived leukemia and was granted a wish by the Make-a-Wish Foundation. He wished to be Batman for a day. A group of dedicated volunteers made his dream come true, hiring an actor to play the Dark Knight and accompany him as he foiled a group of "villains" around San Francisco. Miles went viral, becoming known across the globe as "Batkid." The documentary Batkid Begins looks at how this amazing feat was accomplished. Over the course of 87 fast-paced minutes, we hear the story of Miles' illness and recovery, the way in which the good folks at the Make-a-Wish Foundation worked overtime to create the most immersive experience possible, and how the public got involved, which turned an already big event into something massive. The latter section of the film follows Miles on his big day, showing how much fun he had, but also capturing some of the little hiccups along the way. (At one point, he gets tired and contemplates quitting.) Even if Batkid Begins isn't the deepest documentary ever made, the look at how a whole bunch of people came together to give one little boy a special day will make you feel good about humanity. In Open Windows, Elijah Wood plays Nick Chambers, the owner of a website dedicated to actress Jill Goddard (Sasha Grey). He thinks he's won a contest to meet the object of his fascination. In reality, he's a pawn in a deadly game. A man claiming to be Jill's manager contacts Nick via computer, granting him access to her cell phone and computer after she allegedly cancels their rendezvous. From there, the man proceeds to lure his prey further and further into a security breach that puts multiple lives in danger. We're leaving some key details out of that plot synopsis so that none of the good stuff in Open Windows is spoiled for you. What you need to know is that director Nacho Vigalondo (Timecrimes) stages the action entirely on Nick's computer screen. Different windows pop up showing us various pieces of action. Jill's personal devices, security camera footage, and email exchanges all come into play. The end result is a fast-paced look at some of the dangers of modern-day hacking. Yes, everything is intentionally taken to the extreme, but it's all rooted in enough basic reality to make you triple-check your own security settings. Open Windows is an ingeniously-structured and insanely entertaining thriller that deserves a look. Kelly & Cal, directed by Jen McGowan, stars Juliette Lewis as Kelly, a former punk rock chick-turned-suburban wife and mother. She's experiencing a bad case of postpartum depression that renders her unable to form a bond with her infant child. Kelly's life starts to turn around when she meets Cal (Jonny Weston), a high school student from the neighborhood who is confined to a wheelchair. The two form a fast friendship. Cal gets Kelly out of her funk, but it eventually becomes clear that he's far from the happy-go-lucky guy he outwardly seems to be. Anchored by an excellent lead performance from Juliette Lewis, Kelly & Cal is one of those little slice-of-life movies that make you feel as though you're eavesdropping into someone else's life for two hours. The film takes great care to build the relationship between the characters so that you can sense how important the friendship is to each of them. There are some wonderful moments of humor, as well as insightful looks at serious subjects like depression and feeling as though you have to repress your real identity (Kelly herself yearns for the wildness of her punk rock days on occasion). The next time you're in the mood for a sensitive, warm-hearted indie, check out Kelly & Cal. It'll make you smile. If you only know Elisabeth Moss from Mad Men, prepare to see her in a whole new light. In Alex Ross Perry's Queen of Earth, the actress plays Catherine, a woman experiencing deep depression after being dumped by her boyfriend and losing her father. She and her best pal Ginny (Katherine Waterston) go to the latter's lake house for what is intended to be a week of emotional recovery. Instead, repressed jealousies and resentments bubble to the surface, putting their friendship to the test. In what has to rank as one of the most audacious directorial choices of recent times, Perry plays this intimate personal drama almost as though it's a horror film. The musical score sounds like something you'd hear in a cabin-in-the-woods thriller, while individual scenes build such heightened tension that you expect the story may end in a bloodbath. This rather unconventional approach goes a long way toward helping the viewer understand how terrifying Catherine's depression is to her. Moss gives a masterful, multi-layered performance that, had Queen of Earth received a more substantial release, almost surely would have earned her some Oscar buzz. Here's a movie that you'll be thinking about for days after you see it. Darling runs a tight seventy-five minutes, but it contains enough horror to fill a running time twice that length. Lauren Ashley Carter plays the title character, a mousy young woman who lands a job house-sitting for the stuffy Madame (Sean Young). The brownstone is fairly normal, except for a locked door at the end of a hallway, which Darling is instructed not to open. Almost immediately after arriving, she starts having graphic bloody hallucinations that cause her personality to change for the worse. The movie keeps you guessing as to whether she's mentally ill or whether there's something behind that door that's behind it all. Director Mickey Keating uses some inspired stylistic choices to create an unsettling mood. Darling is filmed in stark black-and-white, strobe effects and borderline-subliminal shots are intermittently inserted, and sounds are manipulated to give them an eerie tone. The true horror, however, is provided by Lauren Ashley Carter, who is nothing short of sublime playing the disturbed central character. She's proof that a great performance in the middle of a fright flick cranks everything up a notch or two. Her work in Darling will give you the shivers. 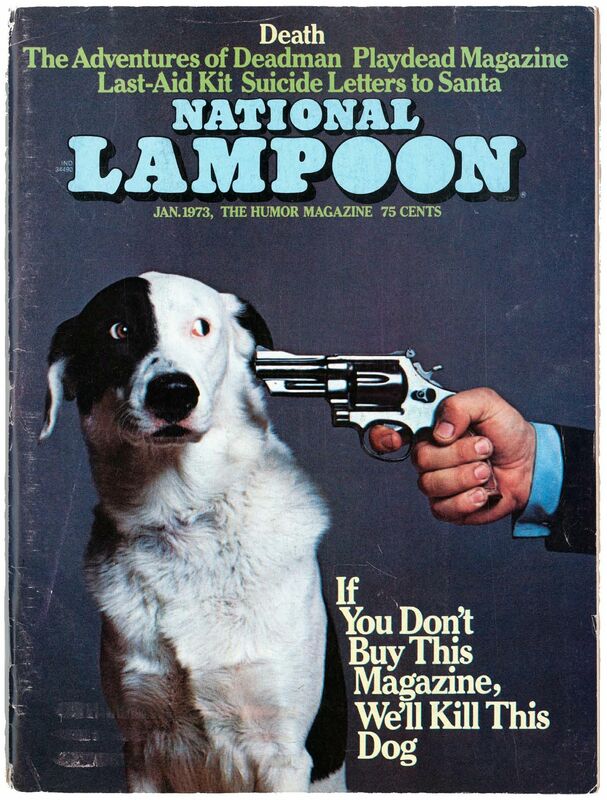 National Lampoon magazine pushed a lot of buttons in its heyday. It was known for extremely edgy humor that often had a political and/or sexual bent. There were no sacred cows to its writers, which resulted in a great deal of controversy. (This famous cover was actually pretty mild for them.) The documentary Drunk Stoned Brilliant Dead: The Story of the National Lampoon takes you deep inside this revered publication, detailing how the often difficult personalities of its staff (which, at one point, included eventual The Breakfast Club filmmaker John Hughes) created a combustible atmosphere that generated comic magic. The film also examines how the magazine spawned a stage show, a radio program, and several motion pictures (Vacation being chief among them) that introduced the world to top talents like Chevy Chase, Bill Murray, John Belushi, and Christopher Guest. Many of the surviving members of the Lampoon team appear to provide personal recollections of the drug-fueled behind-the-scenes shenanigans. Perhaps most touchingly, Chase becomes emotional discussing the tragic death of the magazine's co-founder Doug Kenney. It's clear that those associated with this groundbreaking magazine had a lot of affection for each other. Drunk Stoned Brilliant Dead is required viewing for anyone who cares about comedy. Most movies about people with cancer are depressing. You spend two hours watching someone get sick, then they die in the last ten minutes. Other People, written and directed by Saturday Night Live head writer Chris Kelly, is different. This semi-autobiographical story is frequently funny, and it ends on an uplifting note that will forever change the way you hear the song "Drops of Jupiter" by Train. Jesse Plemons plays David, a gay comedy writer whose career isn't going as well as he'd hoped. When his mother Joanne (Molly Shannon) is stricken with incurable cancer, David finds himself unable to cope. Only by redefining his relationships with his disapproving father (Bradley Whitford), rebellious younger sister, ex-boyfriend, and other important people in his life is he able to begin the process of righting his path. Plemons is terrific as David, but the real revelation is Molly Shannon, who adeptly avoids every "sick character" cliche movies usually trot out. She captures Joanne's desire to avoid feeling sorry for herself so that she can exit this world with a smile on her face. There are some heavy moments in Other People, for sure. Still, a strong sense of gallows humor pervades the film, guaranteeing two or three laughs for every sniffle. At first glance, The Overnight looks like just one big cinematic dirty joke. Eventually, though, it reveals itself to be an incisive look at what happens during times of marital stagnancy. Adam Scott and Taylor Schilling play Alex and Emily, a husband and wife who have just moved to Los Angeles. They love each other, but the "heat" in the marriage has cooled off a bit. One day, they meet Kurt (Jason Schwartzman), a slightly eccentric artist who invites them over for dinner. After the meal, Kurt and his wife Charlotte (Judith Godreche) suggest they spend the night. Over the course of a drug- and alcohol-fueled evening, Alex and Emily have their views on sexuality challenged by their incredibly uninhibited, free-spirited hosts. There are plenty of riotously funny scenes in The Overnight, particularly a running bit involving Alex's insecurity about his, um, manhood. There's a lot of substance here, too. The movie uses taboo subjects to illustrate how important it is for couples to keep finding new ways to connect, excite each other, and maintain the passion. Scott and Schwartzman are hilarious, giving performances that can most accurately be described as fearless. But the real standout here is Taylor Schilling, who makes vivid Emily's growing suspicion of their new friends' motives. She takes a conventional straight-woman role and turns it into the funniest thing in the whole film. The Overnight is a delightfully provocative comedy that will make you laugh and gasp simultaneously. Do you have a favorite unsung hero that's currently streaming on Netflix? Recommend it to us and our readers in the comments!